A sewer drain clog can be a serious problem that may qualify as a plumbing emergency and a potential health concern. Without a route to the main sewer system or septic field, wastewater may have no where to go but to back up into your fixtures or up through floor drains. When faced with a sewer line drain clog, you should not use any of the plumbing in the home until the stoppage is cleared out. Homes with city sewer service have a single horizontal sewer drain pipe running underground from the house to the street. The drain pipe is usually 4 inches in diameter but can be as small as 3 inches. This main sewer drain pipe under the yard is connected to a main drain inside the house, which accepts the waste water from the individual branch drains serving each plumbing fixture, including sinks, tubs, showers, and toilets, as well as the washing machine. These branch drains are smaller pipes, usually 1 1/4 to 2 1/2 inches in diameter. If the main sewer drain is clogged, it can eventually back up all of the drains in the house, which is why such a clog can be so serious. At the very least, a clogged main sewer drain pipe may cause waste water and raw sewage to back up through a floor drain into the basement or floor of hour home. Here are some signs that you may be facing a clog in the main sewer drain line. An obvious sign of a sewer drain clog is when more than one plumbing fixture backs up at the same time. Toilets are often the first fixture to experience problems, but any other low-lying fixture can also be involved, such as a shower or bathtub on the main level of your home. If you suspect that you have a sewer drain clog, start by checking the toilet, followed by other fixtures. Check for odd sounds or behavior at the following fixtures, starting at the lowest level of the house. Main sewer drains usually become clogged somewhere between the house and the street, and because backups start at the clog and move up, so the lowest drains and fixtures are usually the first to back up. Toilets: Toilets have the most direct path to the main drain and use the biggest drain pipes of all of the fixtures, so this is often where problems appear first. You may notice that a toilet doesn't flush properly, or that it gurgles when water is running down a sink, tub, or washing machine drain. This is a telltale sign of a main drain problem. Tub and shower: Other drains typically affected by a main line stoppage are those in the tub and shower. This is due to the fact that they sit at a lower level than sink drains. Check to see whether the tub and shower drains are blocked. Showers and tubs may also fill with wastewater when there's a significant backup. Run the sink: Another strange reaction to look for is trapped air in the plumbing system. If you run water in a sink—especially the sink closest to the toilet—you may hear the toilet gurgle or see the water level in the toilet rising. Washing machine: An unexpected sign of a sewer drain clog can happen when you run the washing machine. If the water draining out of the washing machine causes the toilet to overflow or backs up into the tub or shower, it's a good sign the sewer drain is clogged. Note: This symptom can just be a washing machine and shower problem and not a sewer drain clog. If the toilets are still flushing fine while this occurs, the problem is likely due to a washing machine stoppage and not the main drain. A drain clean-out is a special fitting or a short pipe attached to a drain pipe. It usually has a round threaded plug with a square, nut-like stub on the end. It can be located at the bottom of the large vertical soil stack, or is sometimes mounted in the floor at the point where the horizontal main drain pipe runs out to the sewer main. Gripping the nut with pliers or a pipe wrench allows you to unscrew and remove the plug to access the inside of the pipe. Most homes have at least one clean-out on their main drain or main sewer line. They are usually located in the basement or crawlspace or in the yard. If your problem will require assistance from a sewer specialist, this is the fitting he will use to attempt to clean the main drain. However, be very careful before removing a clean-out plug the basement or crawlspace. If your main drain is backed up into the house, there may be a lot of wastewater—and pressure—in the pipe; any water and waste in the pipe above the clean-out fitting will gush out as soon as the plug is removed. If you begin to see wastewater seeping out as you loosen the plug, it's a sign you should put the plug back. If your clean-out fitting is outside the house, you can attempt to remove the plug, but be careful. If water oozes out while you're loosening the plug, tighten the plug and call a plumber or drain specialist. If you can remove the plug without a spillover, look into the drain with a flashlight; any water in the pipe indicates a clog in the main sewer drain pipe. Don't run the water or flush the toilet! If you don't add water to your drain system, you can't make the problem worse (that is, if the clog is in your line and not the city's main; see below). As an added precaution, you can shut off the main water supply to the house so that no one runs the water by accident. Tell everyone in the house not to use water, then call a plumber or drain specialist to have the drain cleared. These professionals have special equipment, including motorized augers, to quickly and effectively remove large clogs in main sewer drains. What if it's a City Sewer Main Problem? If you live in an established community rather than in a rural area, your home's sewer drain connects to the city sewer main under the street. 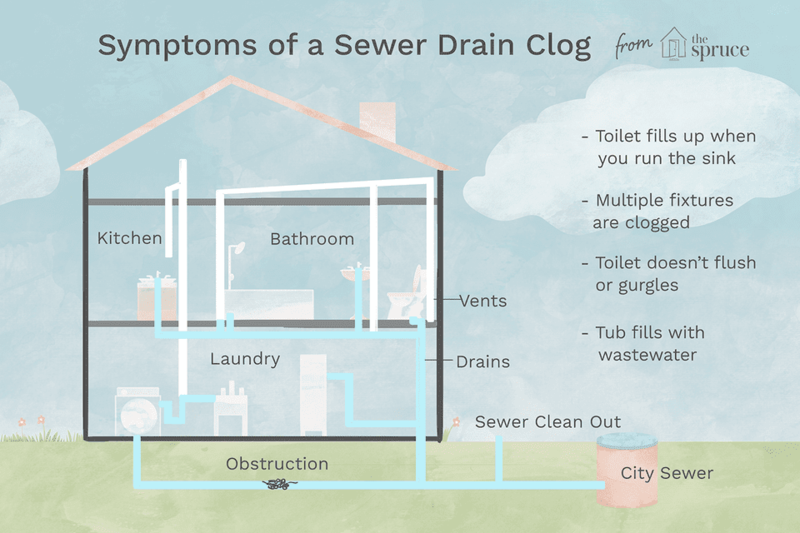 If your house main drain is backed up, chances are the clog is in your own sewer drain line, but it's possible the city sewer main has a major blockage. Either way, your home's drains will behave the same way, although sometimes city backups have enough pressure to actually force raw sewage into home drains, flooding bathrooms. The best way to tell whether the problem belongs to you or the city is to check with your close neighbors. If they also have problems, there is a good chance the problem lies with the city sewer main. If city utility workers come out to investigate, they are allowed to repair only problems with the main sewer line; they can't handle problems with your individual main sewer drain pipe. Be aware, though, that you and your neighbors may be assessed and billed to pay for repairs to a sewer main problem confined to your neighborhood. In rural areas, wastewater and sewage does not flow to a municipal sewer system, but instead flows out to a septic tank and drainage field in your yard, where the water gradually seeps down into the soil and raw sewage safely decomposes beneath the ground under bacterial action. A main drain backup in these systems sometimes occurs when the septic tank or drainage field becomes full or saturated, at which point it can no longer accept additional waste water. Such a situation often occurs during localized flooding conditions, or if the septic system is undersized for the needs of the home. Such problems with a septic system will require help from a professional service, whose response may be to pump out the septic tank. Severe and recurring problems may require major work, involving digging up the yard to make modifications to the system.